Al Qaeda commander Mokhtar Belmokhtar, the head of the al-Mulathameen Brigade and its sub-unit, the al-Mua’qi’oon Biddam. Image from Sahara Media. Mokhtar Belmokhtar, a senior leader in the al-Murabitoon Brigade, an al Qaeda-linked jihadist group that operates in West Africa, has recently sided with Ayman al Zawahiri in his dispute over Syria with the Islamic State of Iraq and the Sham. Additionally, Belmokhtar called Zawahiri his “emir,” or leader. Belmokhtar, who is often portrayed as a desert bandit, addressed the conflict between the Al Nusrah Front for the people of the Levant, al Qaeda’s official branch in Syria, and the Islamic State of Iraq and the Sham in an official statement posted on Twitter on April 29. The statement, which was signed by “Khalid Abu al Abbas, Member of the Shura Council of al-Murabitoon,” was obtained and translated by the SITE Intelligence Group. Khalid Abu al Abbas is a nom de guerre of Belmokhtar. In the statement, Belmokhtar said that Zawahiri, Osama bin Laden, and Abdullah Azzam have been “at the forefront” of waging the “global project of jihad” against Muslim governments and the West, and have been seeking to restore “the rightly-guided Islamic Caliphate.” Bin Laden was killed by the US in a raid in Abbottabad, Pakistan in 2012, and Azzam was killed in a bombing at a mosque in Peshawar, Pakistan. “I call upon my mujahideen brothers in al-Sham [Syria] to return to the truth and to reconcile before the war comes for the fruit of your jihad and the best among your men,” Belmokhtar continued. His statement is the latest by jihadist leaders weighing in on Al Nusrah-ISIS dispute over ISIS’ attempt to subsume jihadist groups in Syria. The ISIS has refused to enter into sharia courts in order to resolve the dispute, and its leaders have accused al Qaeda of turning away from the establishment of Islamic states. Belmokhtar’s pledge to Zawahiri and al Qaeda officially dispels the reports that his split with al Qaeda in the Islamic Maghreb, al Qaeda’s branch in North Africa, meant he no longer would work with the terror group. He broke off from AQIM in late 2012 due to a leadership dispute with the group. Abdelmalek Droukdel, the emir of AQIM, complained that Belmokhtar took orders only from Al Qaeda General Command and refused to deal with AQIM’s bureaucracy. A spokesman for Belmokhtar, Oumar Ould Hamaha, confirmed that Belmokhtar and his group, the Those who Sign with Blood Brigade, or al-Mua’qi’oon Biddam, remain under the orders of al Qaeda central. Additionally, Belmokhtar’s split was engineered “so that we can better operate in the field that we have left this group which is tied to the ‘Maghreb’ appellation. We want to enlarge our zone of operation throughout the entire Sahara, going from Niger through to Chad and Burkina Faso,” Hamaha told The Associated Press in December 2012. Despite splitting with AQIM, Belmokhtar’s forces continued to fight alongside the group and Ansar Dine, AQIM’s political front, in northern Mali. Shortly after splitting from AQIM, the Those who Sign with Blood Brigade launched the deadly suicide assault on the In Amenas gas facility in southeastern Algeria. 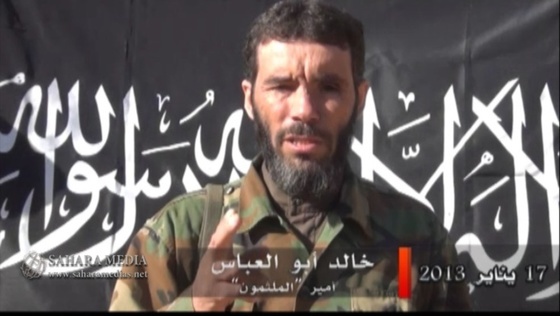 Belmokhtar released a video and claimed the In Amenas suicide assault under al Qaeda’s banner. “We in al Qaeda announce that we carried out the blessed commando operation,” Belmokhtar said in the video, according to Sahara Media. Additionally, the terror group called for the release Omar Abdel Rahman (the “Blind Sheikh”) and Aafia Siddiqui (“Lady Al Qaeda”) from US prisons, two common al Qaeda demands, as well as an end to the French intervention in Mali, in exchange for the release of American hostages captured at In Amenas. In May 2013, Belmokhtar united his group with Ahmed el Tilemsi’s Movement for Unity and Jihad in West Africa (MUJAO, another al Qaeda sub-group) to form the al-Murabitoon Brigade. Both Belmokhtar and el Tilemsi ceded control of the al-Murabitoon to an unnamed commander who has waged jihad against both the Soviets and the US in Afghanistan. On Dec. 18, the US State Department added Belmokhtar’s al-Mulathameen Brigade, his unit while he was in AQIM; the Those Who Sign in Blood Brigade; and the al-Murabitoon Brigade to the list of Specially Designated Global Terrorist entities.